Hey guys! So last night the Hubs took me by surprise and picked up ingredients for and found a recipe to cook my favorite dish together, linguini and clams in white wine sauce. I have always loved this Italian favorite, ever since I was little. It also happens to be one of my dad's favorites, which is probably how I fell so in love with it. I have always been a bit intimidated to make this on my own, but luckily my knight in shining armor was with me in the kitchen to help me out. I must say this recipe had quite a few steps, but everything ended up going very smoothly and tasted divine. This is the perfect date night in food and a blast to cook with someone else. Its also a bit out of the ordinary if you are trying to impress that special someone. I hope you enjoy our rendition of Chef Anne Burrell of Food Network's Linguini with White Clam Sauce. Was your clams well in cold water and set aside. Heat a large saute pan over medium heat. Coat the pan with half of your olive oil and add five of your smashed garlic cloves to the pan. Cook the garlic until it is golden brown and becomes aromatic, then remove from the pan and set aside. Add one dozen of your clams, your water, and your white wine to the same saute pan and cover. Boil over medium high heat until all clams open (about ten minutes). 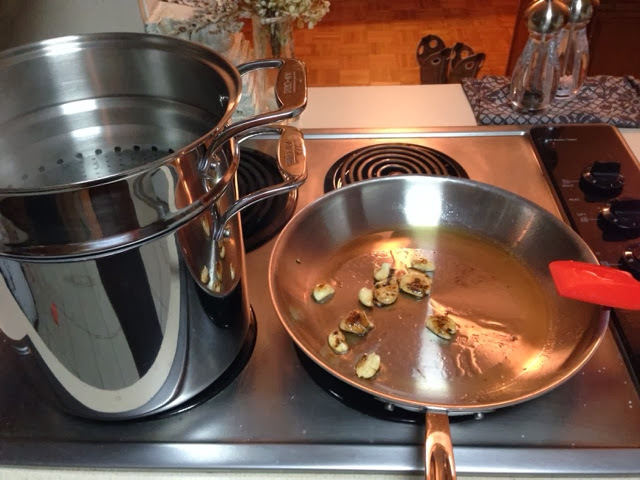 Remove the clams from your pan and reduce your pan liquid (about an additional five minutes). Once liquid has reduced, transfer it to a glass bowl. Allow your first round of clams to cool slightly and then remove from the shells and set aside. Return your saute pan to the heat and add the remaining olive oil and garlic. Repeat the browning process once again, and remove the toasted cloves. Add the remaining clams as well as the reduced clam liquid to your pan, making sure not to add any sand or settlements that have sank to the bottom of the bowl when cooling (you may loose some liquid because of this and that is fine). Again, cover the clams and cook until all shells open. Also, add your pasta to the boiling water and cook as the package instructs. Drain pasta and set aside. 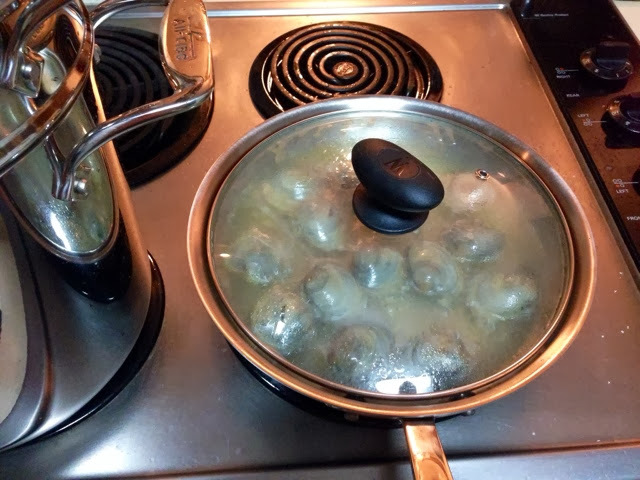 Remove the clams from the pan once they have opened, but this time leave them inside the shell. Add your butter to the pan as well as your red pepper flakes, a pinch of salt (very little salt us needed) and a few of your garlic cloves. Add the de-shelled clams back to the pan and toss with the sauce to warm. Add your pasta to the pan as well as most of your cheese and parsley (leave some for garnish). Toss until pasta is well coated, then add the clams in their shells to the pan. Give a few more quick tosses then remove from the heat and pour into a bowl. Garnish with the remaining cheese and parsley, serve and enjoy!